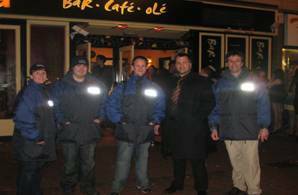 Established in 2008, Chelmsford Street Pastors are now a familiar sight on the Chelmsford weekend nightlife scene. We are acknowledged as a force for good, not only by pubbers and clubbers, but also by the police, CCTV authorities and pub/club owners. Local authorities have commented that since the scheme started there has been a significant drop in the level of anti-social behaviour on Friday and Saturday evenings in Chelmsford. This is borne out by the awards and accolades the city has received in recent years (see below). The Street Pastors scheme is a Church response to urban problems, engaging with people on the streets to care, listen and dialogue. It was pioneered in London in 2003 by Rev Les Isaac, Director of the Ascension Trust, and has seen some remarkable results, including dramatic drops in crime in areas where teams have been working. Each city project is set up by Ascension Trust and run by a local co-ordinator with support from Ascension Trust as well as local churches and community groups, in partnership with Police, Council and other statutory agencies. 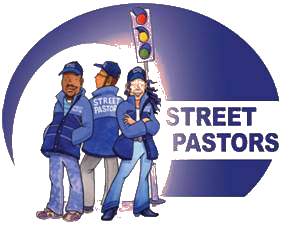 Churches Together in Chelmsford operates the Street Pastors scheme in our city. Local volunteers from our leading churches (including Trinity Methodist, Central Baptist, Elim, Oasis and others) undergo 12 weeks professional training before going out on the streets. What do Street Pastors do? Chelmsford is booming! On any given Friday or Saturday night, the city is teeming with up to 15,000 people. But when the bars, pubs and clubs turn out, it can sometimes be a time of tension and tears on the streets. 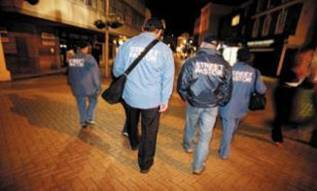 During these periods (10pm - 4am) we deploy a team of Street Pastors, focussing on the city’s known hotspots. The teams of 3-4 (including both men and women) look to help people with anything from finding a taxi to assisting those worse for wear on drink/drugs, even helping to diffuse arguments occasionally. As our Street Pastors get to know people in the community, they find out their needs and what can be done to help. Despite the title 'pastor', the role is not about preaching, but one of listening, caring and helping – working in an unconditional way. Additionally, and equally as important, there is a team of pray-ers at the Street Pastors’ base who receive regular calls from the Street Team so that they can pray into the various situations going down on the streets. YES! – We've already seen a reduction in anti-social behaviour in Chelmsford. In London, where schemes have been running for much longer, they have seen massive drops in street crime in areas where Street Pastors operate. This pattern is reflected across the country wherever partnership and prayer result in the presence of Street Pastors. 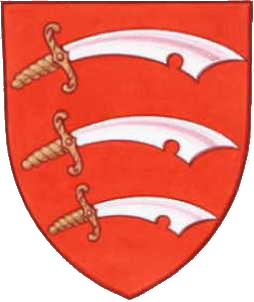 In 2010, the World Health Organisation accorded Chelmsford the accolade of being the UK's first 'Safe Community'. And this year, the city has been re-awarded the Purple Flag Award (which is similar to the Blue Flag for beaches and Green Flag for parks). To achieve Purple Flag status, the town or city must be welcoming to everyone, offer safe ways for visitors to travel home, provide a good mix of venues and be appealing in the evenings. We are also involved with the Safer Chelmsford Partnership, which is the local organisation headed by the City Council in conjunction with the Police, Fire Service, NHS and Licensing Authority, together with interested charitable and voluntary groups. Its remit is to work continually at reducing the level of crime and anti-social activity in the town.